Highland Towers is a national historic landmark that recently celebrated its 100th anniversary. Located at 340-342 S. Highland Avenue, it contains 36 one-bedroom and two-bedroom apartments. The towers are situated near University of Pittsburgh Medical Center (UPMC) area hospitals and are just a few blocks from the retail shops and restaurants on Walnut Street, South Highland Avenue and Ellsworth Avenue. 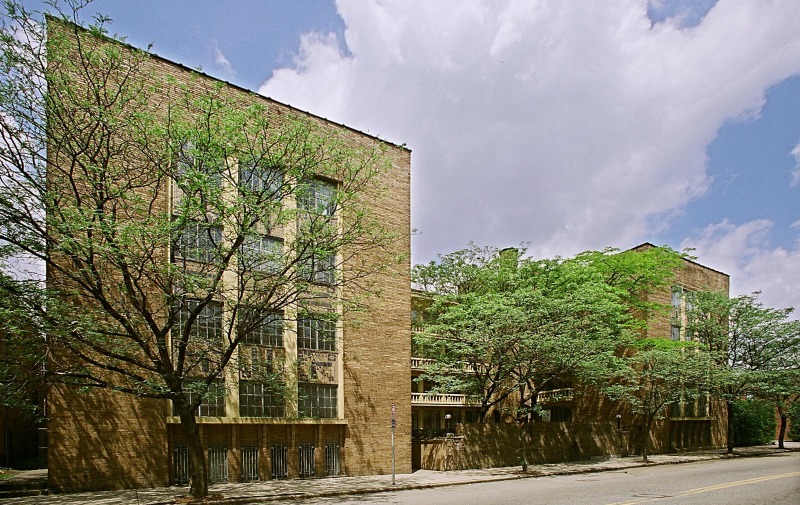 This residence allows quick, convenient access to the best that Pittsburgh has to offer. Franklin West has been the steward of this architectural masterpiece for more than 40 years. Read more about its rich history and architectural design here. The Towers’ stunning design has been featured over the years in many books and movies. Its latest spot in the limelight? At Pittsburgh Filmmaker’s upcoming art show! Debuting at the Melwood Gallery on Friday, April 28th, this event will feature work by Pittsburgh Filmmakers members and students in photography programs, as well as a one-night screening of short films completed by students in The Filmmaking Intensives program. Keep an eye out for photographs of the historic Highland Towers from Pittsburgh-artist Christianna Kreiss! Are you as excited for summer in Shadyside as we are? We could simply burst thinking about sunny mornings, lazy afternoons, and endless activities indoors and out! We’re very much looking forward to the start of Bach, Beethoven, and Brunch: a weekly summer series hosted by Citiparks that brings together two of our favorite things — dining al fresco and live music! Spend your Sunday relaxing on the Mellon Park lawn while an ensemble plays the classics. 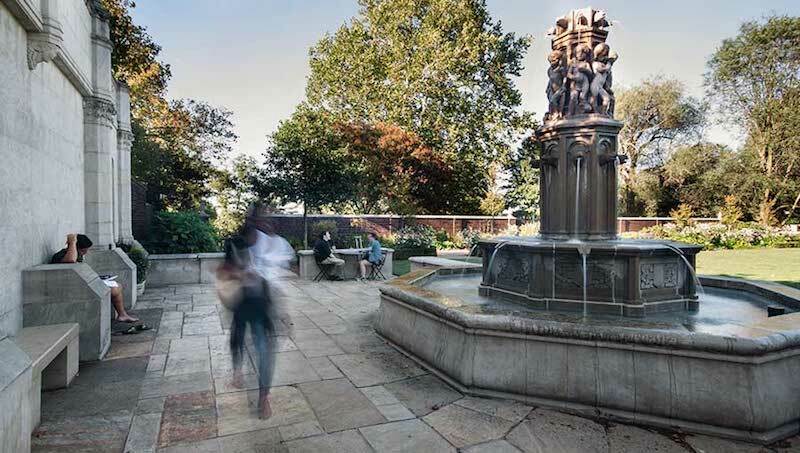 Mellon Park is just a 1-to-2 block walk from the majority of our buildings, including 6315 Fifth Avenue, 6313 Kentucky and units on Denniston Avenue! Admission is free. Simply bring your friends, your picnic blanket, and an appetite for marvelous melodies. A new band or orchestra plays each week, so there’s always reason to attend again. Mark your calendars: Bach, Beethoven, and Brunch returns to Mellon Park on June 18th at 10:30am, and continues each Saturday through August 13th! Fifth Avenue, now the main thoroughfare between Shadyside, Oakland, and Point Breeze, was once known by a different name: Millionaire’s Row. Home to Gilded Age Industrialists and synonymous with wealth, power, and social status, Fifth Avenue’s mansions were stunning reflections of their prestigious owners. Today, only a precious few of Fifth Avenue’s historical homes remain. 5945 Fifth Avenue still stands today under the ownership of Franklin West. 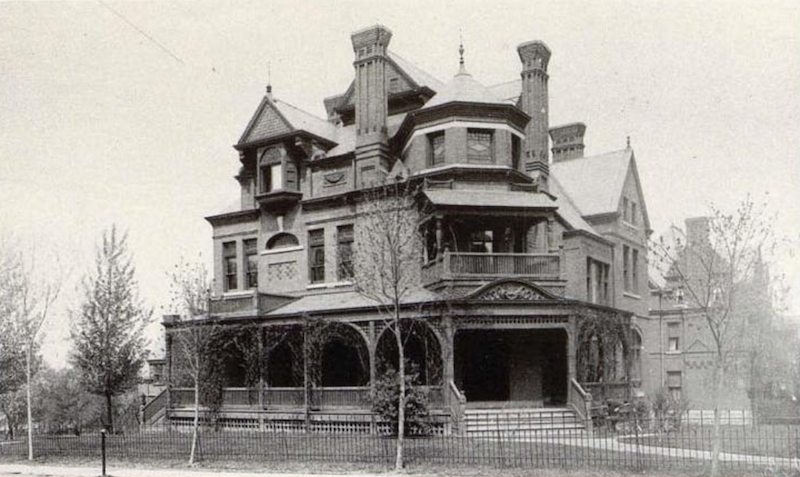 The property’s original owner, J. M. Guffy, certainly fit in with his notable neighbors at the time. Guffy was a gas and oil tycoon with strong ties to Southwestern Pennsylvania. His company, J.M. Guffey Petroleum Co., eventually branched out to form Gulf Oil in 1907 — a millionaire, indeed. While the original architect of 5945 Fifth Avenue is unknown, many original design elements are similar to the work of George S. Orth. 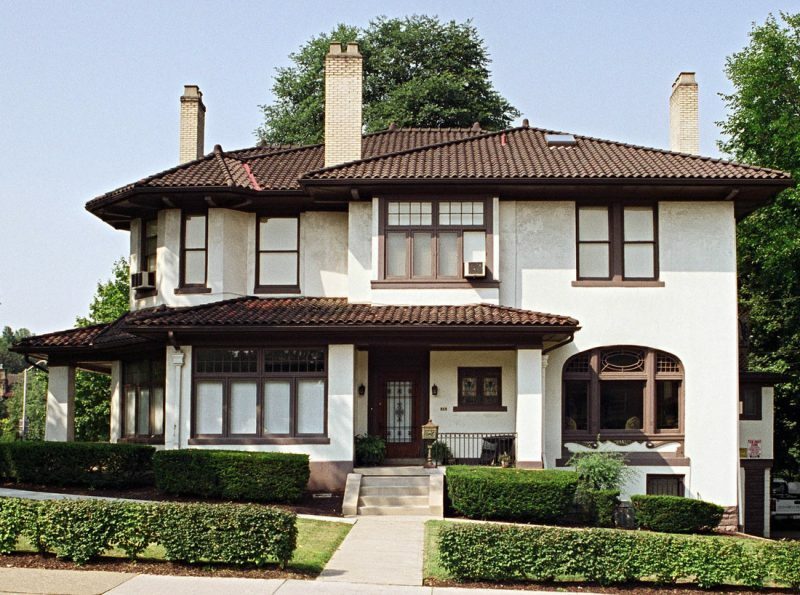 What began as an ornate, red brick Queen Anne Victorian mansion, stands today as a white stuccoed, Praire-style duplex. Franklin West selects and carefully restores buildings of historic value, ensuring their continued use as comfortable residences with architectural integrity. While significantly altered, 5945 Fifth Avenue exists as one of the rare, few vestiges of Millionaire’s Row. This year marks its 134th birthday. Research conducted by Frank Reichard, Wenfei Luo, and Justin Greenawalt for East Liberty Valley Historical Society, Inc. Location, location, location. You may have found your dream job in Pittsburgh, but finding your dream neighborhood is just as important. After all, when it comes to morning commutes, networking with colleagues, and finding fulfilling activities after quittin’ time, where you live is certainly a deciding factor. So, why Shadyside? We’re here to shed light on why this East End neighborhood is the ideal place to live for Pittsburgh’s young professionals and families alike. Founded earlier this year, Shadyside Young Professionals is a neighborhood-centric networking group for the young professionals living and working in Shadyside. With over 150 members, this growing organization hosts meetups and happy hours geared towards getting to know the professionals in your area. Did someone say gin and tonics served with a side of career advancement? Cheers! Whether it’s first round of interviews or your first week on the job, you’re likely going to need some closet refreshes for that dream job you’re eyeing. As they always say: dress for the job you want, right? Luckily, Shadyside has posh and professional workwear in spades. Walnut Street is Shadyside’s main thoroughfare, and is best known for its upscale shopping, fine dining, and private boutiques. On both Walnut Street and in surrounding areas, ladies can find office-ready attire at Banana Republic, Gap, J. Crew, E. B. Pepper, Talbots, and White House Black Market. And, for men? Head to Samuel Baron Clothiers to get a perfectly tailored suit that wows on and off the clock! After-work cocktails with your new coworkers? Head to Casbah for upscale cocktails in a stunning modern space. Meeting up with friends or new neighbors? We recommend Mario’s East Side Saloon or Steel Cactus — both have breezy decks that can’t be beat in the spring and summer! And, for a watering hole that’s really outside the box, book it to Shady Grove or The Urban Tap, where they offer over 100 draft beers and a chic “Urban Garden” space in the back. (Complete with cacti, neon lights, and geodesic cubes.) Need we say more?